I recently acquired some AWESOME Vogue Special Designs dress patterns, but they are several sizes too small and about 10 inches too tiny for me in the bust/waist. I am learning to redraft my own patterns, but in the meantime I would be happy to pay somebody for their expertise in resizing my small patterns into my size and tracing them onto pattern paper for use in my sewing room. Do you know of any companies or individuals who offer this type of service? While I am in the mood to pay others to help with my sewing, are you aware of any companies that offer the service of cutting and marking patterns, then mailing the patters, fabric, and cut pieces back to the owner to complete the sewing? I am so eager to sew that I am looking for shortcuts to speed up production time. Any advice is appreciated! Thank you. And this, from the Threads site, too. I’m not aware of any such service, but I’ll bet the Bakelite buttons in my collection that there were many companies that did kind of thing in the past. I think I even have a vintage fabric card circa. 1930s for door-to-door salesmen would leave behind for prospective customers. Thanks for the posting. 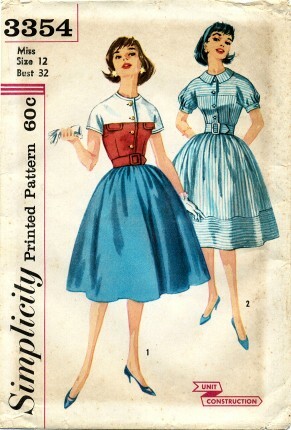 I just traced a 1950s pattern which I am going to have to grade up a size. So this is right on time for me. I’ve used the cut and spread method from the Threads magazine and had really good luck. That pattern is amazing. I think I may need that dress. What’s with the pocket flaps on the bust in that pattern? I doubt those are functional pockets, so they were added for purely esthetic reasons? Probably anyone over the age of 10 would not want those pocket flaps on there. Thanks for posting the Threads grading method. I had been using the sensibility instructions but they don’t give accurate vertical grade amounts. I was using the other instructions to grade a pattern up 10″. When I looked at the “finished” product, I realized that the underarm and CF measurements couldn’t possibly be the same for both me and someone who was 10″ smaller around than I am! I found the Threads instructions and use those now.I love how the stripes in the pattern go in lots of different directions 🙂 I wish I was creative enough to make that happen. THANKS FOR THE TREADS ARTICLE IT WILL COME IN HANDY. i HAD THAT BEFORE AND ACCIDENTLY TOSS IT AWAY. Yes, thanks for the THREADS version as stated above by chantelle. I did not like the S&S one either; I usually use my drafted sloper and begin there, and yell, cry and scream the rest of the way. God Bless. If Kate (or anyone) manages to find a company that will cut out the patterns and mark them, let me know! Although, I’d probably continue to do it myself, since I’ve gotten used to altering patterns for me. Still, it would be nice to have the option of getting someone else cut everything out.Years ago, my landlady did all the pattern layout and cutting for me, and I really appreciated it. I wonder if I can find her and convince her to do that again? Sandra, I was just talking about the walkaway dress yesterday. Please share! I don’t know this with absolute certainty, but I’m willing to bet that if you posted a request on Etsy’s ‘alchemy’ tab, you could find someone who loves grading patterns and would be willing to do so for a fee. i know a lady who knows how to draft patterns. i’ll ask her about grading and then aim her at this post. that pattern is so fantastic! SO! FANTASTIC! @ Sandra: you are a genius for figuring this out and saving me the trouble for my next walk-away. Now, where did you put your pockets? Thanks for that information.I’m learning to draft patterns, but learning to grade will be invaluable for getting things like collars and cuffs right. Great and timely post because I usually find patterns I love that are too tiny or (more often than not) too big and not by just a little, too. Yay for ADAD!Now is it just me, or do the ladies on this pattern look really, really snooty? I mean, yeah you look all that and the dress is fantabulous but really! The down the nose thing? (this post is too long, but I hope it helps someone to create the pattern size they want. )Grading up: You will get your best results when re-sizing a pattern if you start with a perfect fit sloper pattern(as mentioned by “anonymous”). A sloper is how the pros start-and it is the best way to avoid disasters with proportion. Suggestion: If you make your sloper in large woven gingham cotton, your grainlines will be clear and your pattern balanced more easily. You can iron-on stiff interfacing to the back of that gingham fabric after all alterations have been made, and have a perfect fitting pattern to follow.To change a pattern using the cut&slash method (as shown in the Threads article): lay the cut paper pattern you want to enlarge on top of the altered sloper pattern, making the slashed spaces even so your grainline is still straight. You may decide to line up your patterns across the bustline or waistline, then enlarge from there. Just be sure the Center front is aligned, shoulders and underarm meet, and the waistline is centered. What you will probably be left with is a layout of the style lines, super-imposed on top of your sloper’s basic block.Place tracing paper over this and mark the ‘new’ pattern on it. Another way to copy the pattern is to start with a cork board, lay on pattern or butcher paper, then the sloper, and finally the paper pattern that is being graded. Use a pattern wheel with those scary pin wheels and roll around the pattern to transfer the pattern to paper (or go around the pattern with a pin, stabbing the edges with a line of pin ‘dots’). When the patterns are removed, the under paper will have a copy of the pattern in puncture lines.Now, go try out your new pattern! Jane Ellen — it was spoonflower.com — check them out!I haven’t seen the issue of THREADS yet — thanks for the kind words, everybody! Holy moly, you are all SO HELPFUL!I love Love LOVE vintage dresses, but alas have a figure much larger and more, shall we say, endowed than most women from days of yore. Any and all tips for sizing up and adjusting patterns are treasures worth more than gold in my book.Haha, I realize when I reread my question to Dress A Day that it sounds kind of bad to want to outsource all of the tedious parts of sewing… but I guess that IS what I want. Is it wrong of me to want to avoid all of the hard parts of sewing?!?!?! 🙂 I enjoy choosing the patterns, the fabric, and the act sewing into a final product. I just don’t really want to grade the patterns, make adjustments, and do the cutting and marking. It takes soooooo long, and goes against my urge for immediate gratification. In fact, while I am at it, I would be happy to outsource hemming circle skirts as well. 🙂 I think I need to alter my attitude and realize that sewing will be good for building patience!Again, thank you all for your comments and help!